It is fun to accessorize our guns! And reflex sights are no exception. Shooting with these can quickly go from testing the waters to full-time obsession. So what is the best reflex sight for the money? Come check out our top five picks and see what is out there waiting for you. A reflex sight or reflector sight is a type of electronic sight that uses a red dot, or another image, as an aiming point to place on target. It works sort of like a mirror, with the aiming point projecting into the lens and reflecting back to you showing the red dot on target in your image. There are two main styles of reflex sights, open or exposed sights and tube sights. It is easy to tell the difference. Open reflex sights have an exposed lens sticking up to view your aiming point through. Tubular reflex sights’ optics are contained in a tube. Pretty basic. The open style has one mirror lens and a battery operated light that projects into the lens from the front. The tube style has two lenses with the beam of light coming from inside the tube. This may or may not be battery operated as this could use tritium as its light source. There are many advantages to using a reflex sight. For one, there is no eye relief needed as you do not have to align your eye to the optic. This makes reacquiring targets really easy. You can keep both eyes open and simply look at your sight and put the dot on the target! This is incredibly beneficial for getting a fast, accurate shot off. This could be very convenient for someone like a police officer, and many police tactical rifles are indeed sporting reflex sights. Another advantage is that reflex sights are very easy to mount and have been adapted for pistols, tactical rifles, and even some shotgun use. And, as far as price range goes, they are generally less expensive than some other types of red dot sights. Probably the biggest disadvantage of a reflex sight is that they are not magnified, so you’re talking close range. However, there is a separate scope unit that can be purchased and paired with your sight to magnify the image like this AR 15 red dot magnifier combo. Being an electronic type of sight, most reflex sight will require batteries to operate the light. This can really be burdensome, especially if your firearm was modified to have the iron sights removed to make way for the reflector. This would leave you with no sight option if your batteries failed when needed. Some of the tubular styles use a tritium lighted point and do not need batteries. Finally, they can get in the way. For a rifle, it may not be so noticeable as it is very common for rifles to have scopes of various kinds, and most rifle cases are already set up to accommodate the extra room needed for the scope. But a pistol is generally more streamlined. Fitting your pistol into its holster may not work with a reflex sight in place, and it may be necessary to purchase a holster that has been modified for the sight. Reflex sights are fun, and as with any other scope or sight, there are lots of different styles and features to consider. Below is a highlight of our top five reflex sights to help you choose what you want to fit to your firearm. The Bushnell Trophy TRS-25 is a stylish tubular type reflex sight. It is filled with a dry nitrogen gas and claims to be one hundred percent waterproof, fog proof and shockproof. It features a tilted front lens for the reflection of the 3 MOA LED red dot reticle, and a multi-coated amber tinted optic for easy identification in low light conditions. The Bushnell Trophy also sports an illumination control knob for easy adjustment of your red dot in different lighting conditions. You want your red dot to stand out, but not be glaring, as too much light battle can cause distortion of your aim point. There is also a slight resistance in the knob to help ensure your red dot doesn’t accidentally get turned on without your knowledge. Many customers who are a fan of this sight claim that for the money it resists recoil and holds zero well. Other reviews praise the easy install, long battery life, and very durable design. Conversely, some customers complain about the gold versus white lettering one the sight. It states in the highlighted description for this sight that “Bushnell logo color on the product may vary (white/gold).” Per customer findings, the different colors actually differentiate between two different models that have different optical quality but are being sold as the same. Other reviews are claiming sights are defective on arrival, or that the red dot flickers on and off or is very fuzzy. Related Read: Best Scopes for the AK47. BUY YOURS TODAY!! Get one for each of your guns and let us know what you think! 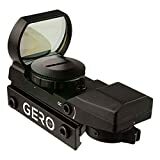 The GERO Tactical green and red dot reflex sight is a lightweight open style sight offering four different reticle patterns. It is heavy duty built, shockproof and water resistant with a built-in Picantinny mount base. The GERO is a great addition for those who want to stay within a budget, but not sacrifice quality. Plus, the GERO comes with an unconditional one year warranty! Customers of this sight are impressed with the ease of installation and the way it holds zero. The red dot stays pretty much dead on as long as you stick with one reticle pattern. The quality of this product along with protective packaging makes it an impressive value. It seems that some customers are finding that the reticle can become less crisp and a little fuzzy. Switching from one reticle pattern to another may throw off your red dot from zero. The Dagger Defense DDHB red dot reflex sight is a smart looking little sight featuring four position reticles, both in red and green dot. A locking set screw has been added to help stabilize your sighting adjustments. This is handy for if your sight is having trouble holding zero, then you can turn it 1-2 times clockwise to lock it into position. Do not turn more than 2 times, for risk of damaging the sight! This sight is constructed of lightweight aircraft grade aluminum and has fan ergonomic design. The side rotary dial serves three purposes, a brightness adjustment, to choose your reticle color from red or green, and is also the battery compartment for your red dot. Customers of this sight have reported nice bright aiming points and sturdy construction. It seems that those who have had some issues with it love their customer service for being polite, professional, and willing to solve problems or replace the product. Unfortunately, it seems that a lot of customers have troubles with blurriness and sighting this in right off the bat, and are having to contact customer service. One customer also complained that the battery life is short, causing some of the problems. The Feyachi reflex sight is a simple open sight with a four pattern adjustable reticle in both red or green. It has a nice wide field of view on a 33mm lens and a secure rail mounting system. It boasts being ultralight at only 4.1oz, shockproof and waterproof with unlimited eye-relief, and a battery included. Not only is this sight well made, but it is a super affordable option as well. Other things that people love about this sight is that it stays zeroed well. Most people who have purchased this are actually very, very happy with it! 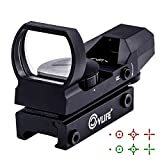 According to customers who have bought and used this, the aiming points stay very clear and not fuzzy unless the brightness is up all the way. It is a stable sight, and mounts easily. It comes with everything you need to get it installed and shooting. Some things people don’t like about the Feyachi is that there really isn’t an on or off switch. Some are reporting seeing a double image of the reticle, unclear image or too much glare. Allen Wrench included helps you adjust elevation and windage easily. Made of high grade Aluminum Alloy, the dot sight is durable and Light weight. The CVLIFE reflex sight is another great “bang for your buck” type scope. This is also considered super lightweight, weighing only about 4.58oz, and with the desirable four changeable reticle patterns in green or red dot. Like other reflex sights, the CVLIFE offers unlimited eye-relief for more comfortable, easy target finding. On any sight or optic, good optical clarity is a must and this reflex sight claims just that. It has an anti-glare reflective coated lens ensuring optical clarity and comes complete with a rubber protective cover and two batteries. Your sure to have a good time with this little beauty! 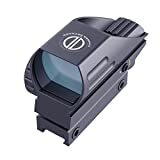 Customers of this sight praise the amazing value, ease of mount and that it zeros in easily, and surprises people that it performs just as well as the higher priced sights. That said, some of the main complaints are of blurred and/or double image, and the reticle either drifts after some use or disappears altogether. Also, this one is not stating whether or not it is impervious to elements, and some complaints have been that it is not shock resistant. What is the difference between a reflex sight and a holographic sight? – Both are red dot type sights. In a reflex sight, the aiming point (light) is projected through a mirrored lens and reflects it back over the image. The holographic sight has the image of the reticle suspended between layers of glass. Are reflex sights good for long range or short distance targets? – Reflex sights are not magnified, so they are generally used for close range targets. Separate magnification scopes can be purchased that pair behind your sight for magnification. What kinds of firearms will a reflex sight fit? – Pretty much anything. They are most common on rifles but are becoming very popular on pistols and shotguns. They can even be fitted onto a revolver if you wanted to mount one. Yes, accessorizing our firearms is addictive. There are so many different features that can be added, and most are not cheap. Indeed, it can be a very expensive obsession to indulge, but as far as optics go, we hope this guide will get you on your way to finding the best reflex sight for the money. Not only do these lighted little optics give a cool feature to your gun, but they are so fun to shoot with. You will be pleased that you’ve added a reflex scope to your firearm optics collection for sure. Happy shooting and you may also be interested in learning more about ACOG sights or equipping your sight with a killflash.